NYC is Blue: Let's Prove NY is Blue! The second meeting between New York City FC and the New York Red Bulls takes place this Sunday (ESPN, ESPN Deportes - 4:30 PM ET). Microsoft Windows wants to know - where do you stand? Are you NYCFC Blue or NY Red Bulls Red? 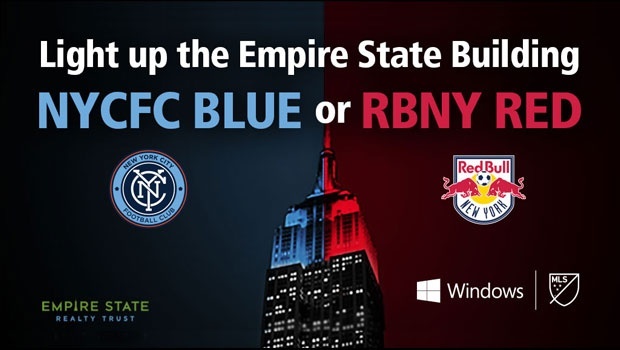 Windows will light up the Empire State Building on Saturday night at 8:30 PM ET with the color of the club that receives the most votes online and in social media. Voting ends at 1:00 PM ET on Saturday, June 27. 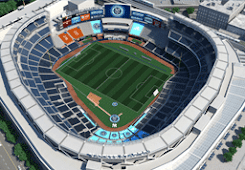 You will be able to vote on that page and by using the hastag #WinNYCFC on social media. Tweets count, as do retweets. We already know that NYCFC has an amazing group of fans. Now it's time to prove it; let's light the Empire State Building blue!